Black is the absolute classic in interior design, while various brown tones are trendy in modern colour concepts for upscale interior decoration. 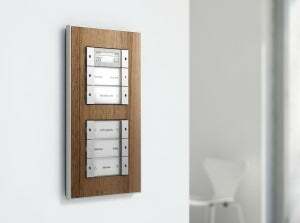 With the expansion of its elegant Esprit switch range to include real materials, Gira offers sophisticated solutions made of anodised aluminium or aluminium with walnut wood veneer. The premium Gira Esprit switch range with its clear forms and carefully selected surfaces has grown by three design variants, which pick up on the current trend of individual living styles. They reflect the topic of reduction and simplicity that are so important for installations and furnishings and offer authentic materials. At the BAU, Gira is presenting two cover frame variants made of anodised aluminium in the colours brown and black as well as an aluminium cover frame with a real walnut wood veneer. Particularly Esprit aluminium with walnut wood veneer allows the user to experience the naturalness of wood in a truly authentic way. Gira Esprit made of anodised aluminium in matt brown matches the various brown tones in modern colour concepts. For frames made of anodised aluminium in matt black, the natural ground structure of the material is also visible in the brown variants. Inserts for the Esprit frames are available in pure white glossy, cream white glossy, anthracite and the colour aluminium. In addition to push switches and SCHUKO socket outlets, 300 functions of modern electrical engineering can also be integrated. For example, various functions of the KNX/EIB system can be controlled with the third-generation push button sensor also being introduced at the BAU, including saving and calling up light scenes, switching and dimming lights or raising and relowering blinds. Each operating button of the Gira push button sensor 3 Basic, Gira push button sensor 3 Comfort and Gira push button sensor 3 Plus can be softly lighted and thus easily found in the dark.